Can you eat pista while pregnant? Yes. The nutrients packed can help promote a healthy pregnancy. But pista can also have side effects; learn how to eat it. Once you discover that you are pregnant, it is normal to worry and check for every single food bite you consume. Also, people around you probably overwhelm you with advice about eating during pregnancy. While certain foods should be definitely avoided during pregnancy, certain other foods should be part of your daily diet during the entire nine months of pregnancy. Pistachios are nutritious nuts; are they safe to eat during pregnancy? Can You Eat Pista During Pregnancy? Pistachios should be part of your diet during the entire pregnancy as they are packed with various healthy nutrients necessary. A good thing is that you can eat quite a lot pista while pregnant because they are low in calories. One ounce of pistachios contains about 160 calories, 12.71 g of fat among with only 1.5 g are unhealthy saturated fats. Pistachios also contain about 2.8 g of fiber and about 6 g of proteins. Pistachios are packed with iron, folate, calcium, and potassium as well. Pistachios are a great source of proteins, a very important nutrient during the entire pregnancy as proteins help the development of muscles and tissues of the developing baby. Pistachios are high in monounsaturated healthy fats which can lower the levels of bad cholesterol in the body, increasing the levels of good cholesterol as well. Pistachios are a great source of antioxidants such as vitamin E or carotene, which boost the immune system during pregnancy. Pistachios are rich in copper, necessary for the synthesis of red blood cells. Pistachios have anti-inflammatory properties which will relieve any swelling problems during pregnancy, especially pain and swelling of the joints which is common especially during the last trimester of pregnancy. Pistachios are a great source of fiber, preventing this way constipation, a common problem during pregnancy. Pistachios are a great source of omega 3 fatty acids that are important for the development of your baby’s brain. Pistachios will prevent infections during pregnancy as they are rich in vitamins A and E, known to boost up the immune system. Pistachios help regenerate the hair and nails which often get brittle and fragile during pregnancy, as they are rich in vitamin E.
Pistachios help normalize the blood pressure in the body as they are rich in iron and calcium. Roasted pistachios contain higher levels of sodium which will elevate the normal blood pressure levels. Higher levels of blood pressure during pregnancy are undesirable. Pistachios contain fructans which interfere with normal function and digestion of the gastrointestinal system, leading often to diarrhea, bloating, flatulence, constipation and even abdominal pain. Eating nuts during pregnancy can increase the chances of developing asthma in children by 50 % in cases when the family has a history of nut allergies. 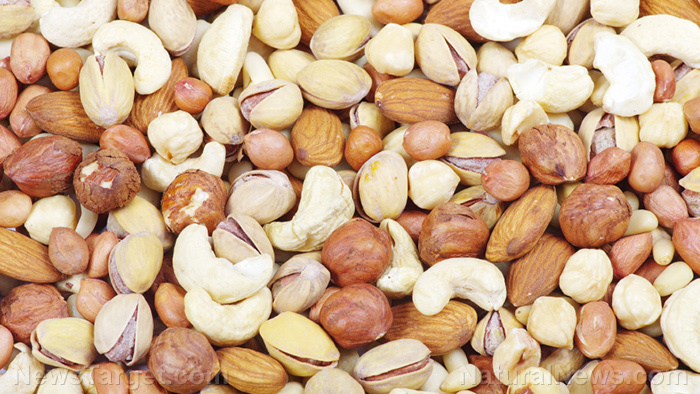 Anacardic acid is the chemical compound found in nuts that cause allergic reactions. Before eating pista during pregnancy, consult with your healthcare provider first to check if they are safe for you now that you are pregnant. 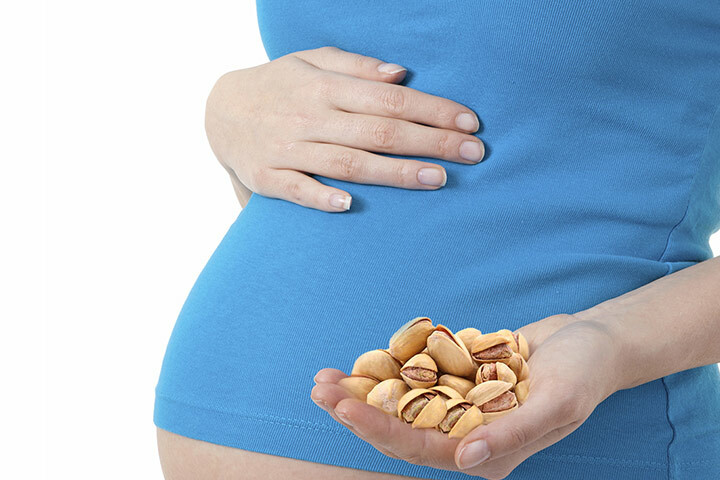 If you are allergic to nuts you should avoid eating any kind of nuts including pistachios during pregnancy. The signs and symptoms of an allergic reaction may vary from an anaphylactic shock to skin redness, hives, and itchiness. Avoid eating more than 15 pistachios a day during pregnancy as if you eat more than that your body will gain large amounts of essential oils, which can lead to a headache and nausea. Overconsumption of pistachios during pregnancy might have an effect on the smooth muscles, which can lead to preterm birth. How to Include Pista in Your Diet? If you don’t have any family history of allergies in nuts, there is no reason why you should not eat pista during pregnancy. However, make sure to eat them plain and in moderated amounts. You can eat pistachios as a snack, sprinkle them into cereals, yogurt or oatmeal, as well as, prepare various meal recipes which contain pistachios too. Walnuts are rich in omega 3 fatty acids necessary for the development of baby’s brain. Walnuts are also rich in monounsaturated fats, lowering this way the level of bad cholesterol in the body. 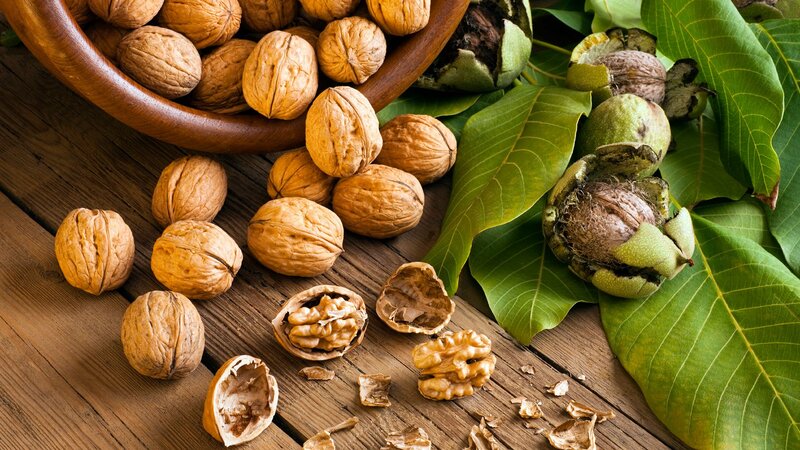 Only one ounce of walnuts contains about 4 g of proteins. Almonds are rich in healthy unsaturated fats which will help lower the levels of bad cholesterol and increase the levels of good cholesterol in the body, helping this way maintain a lipid balance during the entire months of pregnancy. Almonds should not be eaten raw as they can be contaminated with salmonella and other bacteria which can easily lead to food-borne illnesses. For this reason, almonds are recommended only as roasted during pregnancy. 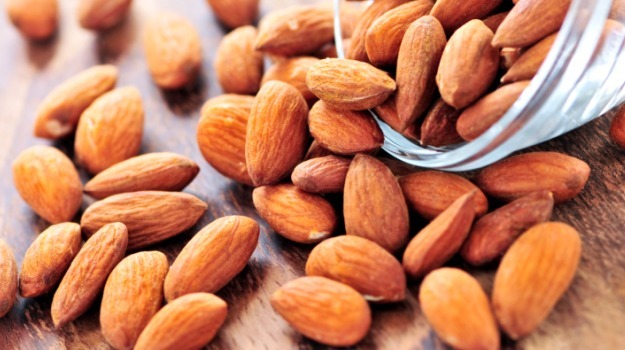 Only one ounce of almonds contains about 6 g of proteins. Also, one other thing to notice is that almonds don’t contain omega 3 fatty acids. 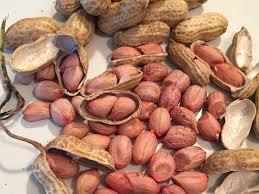 Peanuts are rich in healthy unsaturated fats as well. They are packed with vitamin B complex and folate which can prevent neural tube defects if consumed during the first trimester of pregnancy. Only one ounce of peanuts contains about 7 g of protein. Peanuts often lead to allergic reactions. If you have a family history of nuts allergies, you should consult your healthcare provider first before eating peanuts during pregnancy. According to FDA, other types of nuts such as hazelnuts or pecans are very healthy too. Pecans contain small amounts of omega 3 fatty acids.